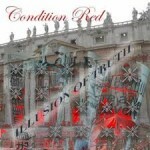 Share the post "Album review: CONDITION RED – Illusion Of Truth"
Lars Eric Mattson is a brilliant guitarist that not very many people outside music fans that dig a little deeper into guitar based music will easily recognize. It’s a shame too because everything I have heard him play on has had something incredible to offer whether it’s interesting musical passages or stunning guitar prowess. In 1999 he formed a band called Condition Red along with keyboard player Alexander King. Such prominent names as Alex Masi and Derek Sherinian were also a part of the bands creation. After releasing two albums the band went on hiatus but are back in fine fashion with their latest offering, Illusion of Truth for Lion Music. I’m completely unfamliar with the previous two albums, sadly, but this one makes me very curious to check them out. ‘Illusion of Truth’ seemingly runs the gamut stylistically, taking proggressive music through many twists and turns. There are times where it has a close kinship to a band like Fair To Midland, then veer into an almost P-Funk inspired groove to a jazz fusion odyssey, without missing a beat. The biggest appeal for me was the masterful fret work. Mattson has such a clean, fluid ability much like that of fusion master Al DiMeola but with a harder edge. Tracks like “Labyrinth,” “Changing,” and “Can’t Sell Your Lie” were my particular favorites, but the whole album really needs to be absorbed in its entirety. This entry was posted in ALBUM REVIEWS, ALBUM REVIEWS (Mobile), All Posts and tagged album, Condition Red, guitar, guitarist, Illusion of Truth, Lars Eric Mattson, metal, progressive, review, rock. Bookmark the permalink.